City of Servia on the Nissava. Its Jewish community dates from the beginning of the eighteenth century, as is shown by a question put to Rabbi Moses Amarillo of Salonica by Gershon, the first chief rabbi of Nish, who had been elected in 1728 (Ḥanukkah, 5489). Gershon, while drawing up a bill of divorce, asked for information on the Hebrew spelling of the words "Nish" and "Nissava," "because this is a new community and such bills have never been written here" (comp. Amarillo, "Debar Mosheh," p. 169). By the end of the eighteenth century Nish possessed an important rabbinical school. The local cemetery still contains the tombs of the rabbis of this period who constituted the religious tribunal, namely, Raḥamim Naphtali Gedaliah (d. 1790); Jacob Téba (1802); Abraham Ventura, son of the author Shalom Ventura (1805); and Judah Moses Heli (see below). 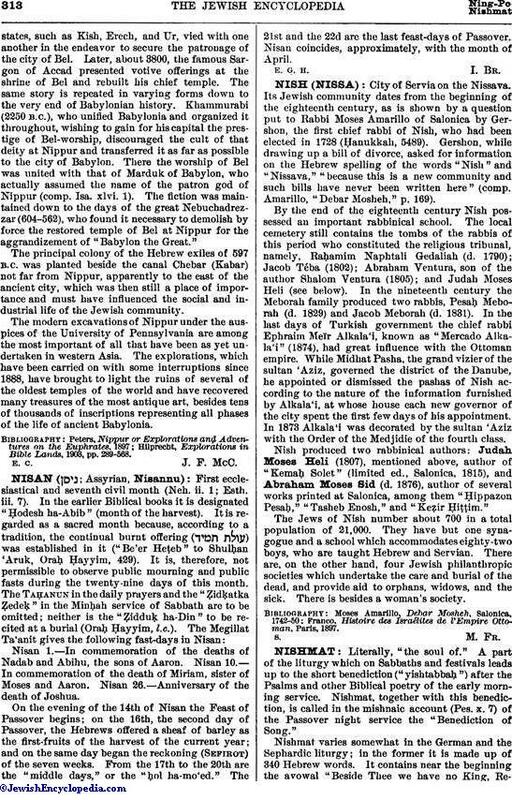 In the nineteenth century the Meborah family produced two rabbis, Pesaḳ Meborah (d. 1829) and Jacob Meborah (d. 1831). In the last days of Turkish government the chief rabbi Ephraim Meïr Alkala'i, known as "Mercado Alkala'i" (1874), had great influence with the Ottoman empire. While Midhat Pasha, the grand vizier of the sultan 'Aziz, governed the district of the Danube, he appointed or dismissed the pashas of Nish according to the nature of the information furnished by Alkala'i, at whose house each new governor of the city spent the first few days of his appointment. In 1873 Alkala'i was decorated by the sultan 'Aziz with the Order of the Medjidie of the fourth class. Nish produced two rabbinical authors: Judah Moses Heli (1807), mentioned above, author of "Kemaḥ Solet" (limited ed., Salonica, 1815), and Abraham Moses Sid (d. 1876), author of several works printed at Salonica, among them "Ḥippazon Pesaḳ," "Tasheb Enosh," and "Keẓir Ḥiṭṭim." The Jews of Nish number about 700 in a total population of 21,000. They have but one synagogue and a school which accommodates eighty-two boys, who are taught Hebrew and Servian. There are, on the other hand, four Jewish philanthropic-societies which undertake the care and burial of the dead, and provide aid to orphans, widows, and the sick. There is besides a woman's society. Franco, Histoire des Israélites de l'Empire Ottoman, Paris, 1897.